I actually made everything planned with last week's menu! This whole being accountable on my blog thing helped! Usually at least one of the meals I planned for the week goes to pot either because I forgot an ingredient or something comes up and I need an quicker meal. Of all the meals the best was Brett's Grilled Ribeye. Unfortunately, I'm not willing to loan him out. Therefore, I suggest you try the White Fish with Parsley Sauce. Next time I make it however, I think I'll add some fresh lemon juice at the end. I tried taking a picture of it, but the results did not make the dish look appetizing! This is what we will be eating this week. Thursday: Spaghetti and Mama Pip's (that's me) meatballs. 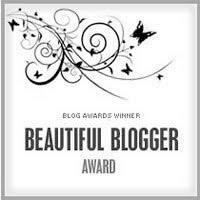 This is horribly delayed, but thank you so much to Amy at The Adventures of JAMC for the versatile Blogger/Beautiful Blogger award. I'm quite honored to receive the award from such an amazing blogger. Blogger and fellow UST alum Jenny at Mama Nash started Pay it Forward Friday. I've been a horrible crab for weeks now and this is just what I needed to remind me that there is good in the word. I haven't been able to see past the idiots of the world over the last few weeks. Check out her blog for the rules and to participate. It hasn't been my most gold star of weeks so I don't really have anything to share on how I bestowed kindness to others. There has been lots of kindness towards me, mostly from my awesome husband. So, my goal this week to to be more aware and working on giving back to those who have been so awesome to me.